I've been kind of quiet in terms of blogging. Actually, I have been getting a little 'crazy' lately. 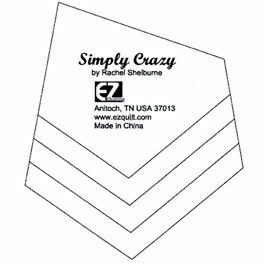 I was inspired by the EZ Quilting Simply Crazy Ruler to make this pillow. I took out my stash of orange, black and Halloween fabrics and went to work. and stitched it with size 8 pearl cotton. 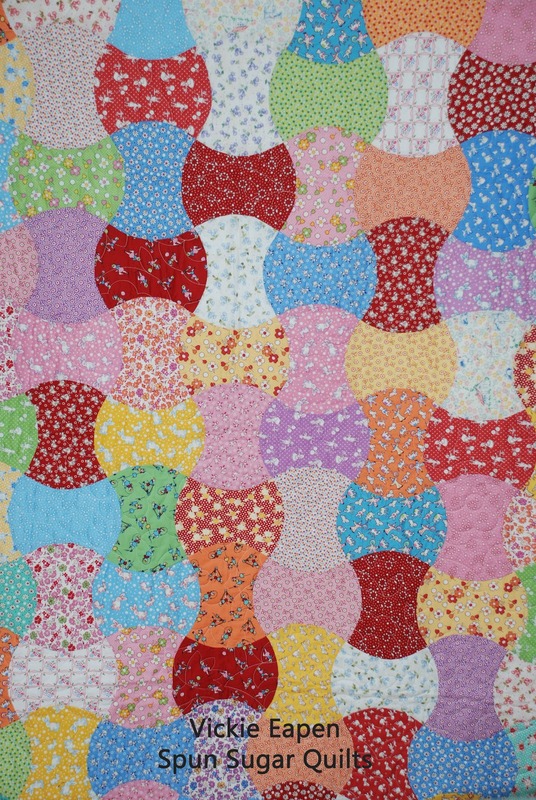 I used the same size 8 pearl cotton for the 'quilting'. I love the big stitch pearl cotton look on this pillow. I am thinking that this ruler would make a great tutorial or inspiration for a new project. Do any of you have this ruler in 'stash'? Just curious if you have it and if you made a project with it. I kind of like it because it helps me with the 'wonky' look that I tend to shy away from. FREE Halloween Candy Corn Runner Pattern using the Go! Cutter. Black background 8.5" X 27"
backing fabric 10" X 29"
Cut 1 21"X 2.5" strip of each color as shown. Take your Go! cutter Isosclese triangle die and lay the strip across it. Cut 8 triangles like those shown above. there will be 4 left over candy corn 'opposites' for another project. Layer the backing right side down, batting and black background right side up into a quilt sandwich. 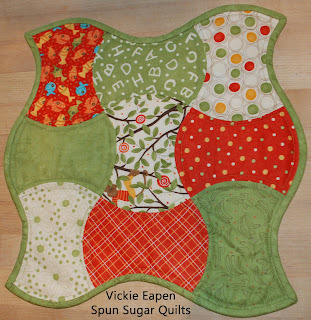 Pin or spray baste all layers for quilting. Next lay 4 of your corn triangles (I chose 4 with white tips like candy corn) onto the background and pin in place. and 1.75” from the edge of the background. Quilt the straight "piecing" lines of the candy corn. Quilt 1/4" around the outside edge of the 'candy corns'. Notice I basically outlined the candy corn with some straight quilt stitching. I used binding that I made with my 2 1/4" Go! cutter strip die. A quick cute Halloween Candy Corn runner for any table. You can download the pdf for this project HERE. A few months back I blogged about this book: Some Kind of Wonderful by Anni Downs. I was smitten about this "bowling ball" style bag for holding projects and stitchery. I pieced the front and the back and I have started stitching the designs. I hope little by little I can squeeze this stitching in between my other quilt projects and work. I'll be sure to show you my progress. Well I managed to sew and assemble them into a top this weekend. This is the back of the top. Yes I pressed the seams. No they wouldn't stay 'put' and kept popping back up. I have never experience this with a quilt top. I was kind of frustrated by this. I suppose it could be the size of the pieces finishing 1 1/4" X 2 1/4" or blocks? Anyhow, I decided not to use batting for this project. So I changed it to a Crafty 9-patch Halloween Runner (it's not a quilt without 3 layers). stitched around the outside edge 1/4" and trimmed it. of an inch to close the opening and finish. And there you go... a cozy little place for my Raggedy Annies to sit. It satisfied my need to create, make a runner for this lonely table, and do it quickly!! I'd say it was a successful weekend. This weekend has brought me time to bake, read and sew. The cookies were inspired by my sisters' baking last weekend. We just had to have more chocolate chip cookies. I haven't felt the need to blog because there just wasn't a lot to blog about. How many blog posts could I write about laundry, dishes and work? I have been also slightly absorbed with new books. My sister brought the entire Twilight series for me to read. Twilight, New Moon, Eclipse and Breaking Dawn. I nearly swore I would never read them. I wanted to read the books because books always seem better than the movies. and I feel I can move on to bigger projects. More halloween-ish projects, tablerunners because I NEED more, felted ornaments...just 3 left to finish, a few more secret projects that can't be shown ....yet. I am sure I will be blogging a bit more now. I have a list of 10 blog posts I want to write soooo that should keep me busy for quite awhile. I'd like to sit here and type that I just can't believe it's been so long since I blogged. I just kinda lost my blogging mo-jo this last 2 weeks. Maybe it was school starting? Maybe it was that I took my time creating "Pages" near my blog header, in which only 2 are finished and published? They take a long time to create for my tutorials because I have made so many. Maybe it's because my husband bought Netflix and I have watched the entire first season of Glee? I have a couple of projects/ WIPs on my cutting table. Cut it up, added some older Moda Halloween lines and some dots and voila! Instant halloween table runner in progress. While watching Glee and various other Netflix movies I have been stitching more of these guys. Note, that I started them in August last year....nearly 1 year to the day! It's a pattern by Garden Moon and there are 12 felt ornies in which I have finished 5. I am pretty pleased with how these are sewing up because the circles are so perfect. I used my Go! cutter circle die and my Sizzix cutter circle die (my DH bought me like 10 years ago). 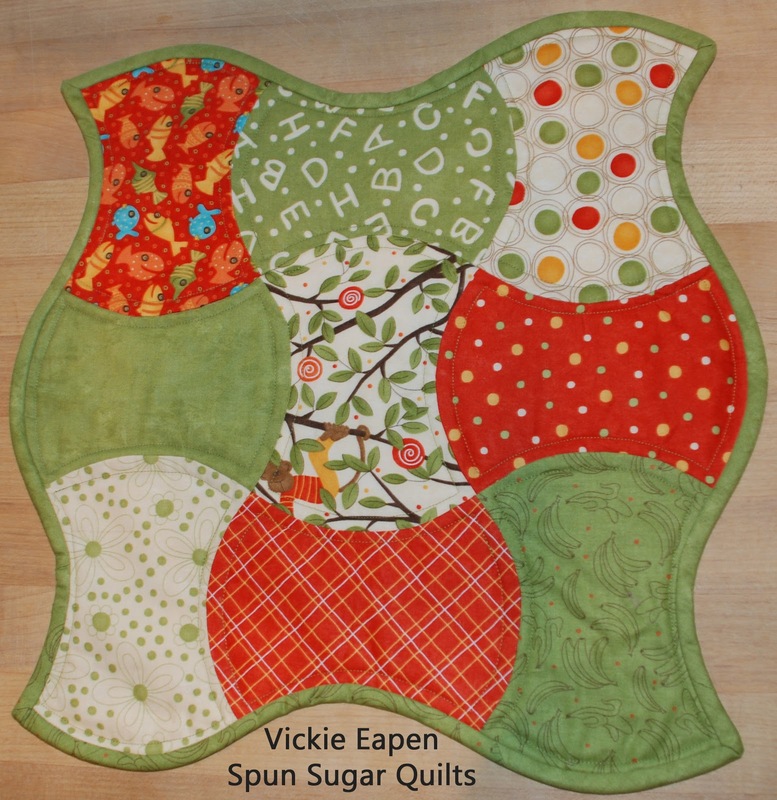 The combination made the circles a perfect 1/4" different just like the pattern. This holiday weekend could be hit or miss for me in terms of blogging because I have a bunch of family coming. and I mean a BUNCH. but it's all good and we are happy to have them.